Situated on glorious Bodden Town Beach, Sea Palm Villas boasts lush tropical landscaping studded with palms and fronted by a lacy shoreline washed in crystal-clear tropical waters. Accommodation includes 12 x exquisitely private one bedroom villas beckoning to guests with plush resort amenities. Each villa has an oceanfront balcony overlooking the calm Caribbean waters, as well as modern and comfortable furnishings. Resident Manager on Call 24 hours. The original developers of the Turtle Nest Condos have introduced to the Grand Cayman Resort let market 12 exclusive and intimately private villas. Each villa has been designed to provide uninterrupted ocean views utilising glass balustrades all of which are only 90 feet from the Caribbean Sea. 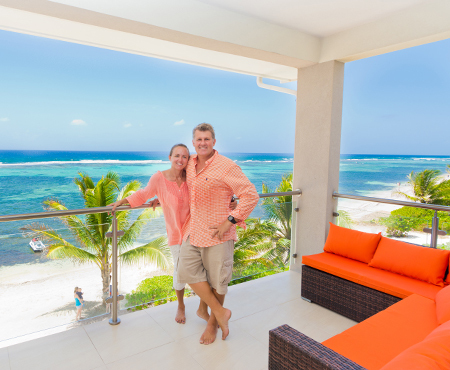 Sea Palm Villas was developed, owned and now managed by Sean and Jacqueline, therefore, providing some of the most exclusive beachfront accommodation on Grand Cayman at a fraction of the price. Please contact Sean or Jacqueline at info@seapalmvillas.com.